So much for my plan to publish post each week - my lap top was away being fixed and so I wasn't able to post! It's been quite a busy time though, I am mentor to a textile group called Out of the Fold, and they have just had their first exhibition since they graduated from the Diploma City and Guilds course. The exhibition was at Cottenham, part of Textiles in Focus. It was a great success, they had very postive comments from many visitors and they sold alot of handmade items, from books bags, cards and hangings, they have been invited to be part of another exhibition at Sutton Hoo [ I don't know the dates at the present time], one person has been asked to teach a technique to another group and one lady has had a commission. So a great boost to their self esteem, and very exciting for me to see their growth as individual artists. I say "they" as I felt it was their exhibition, I just had a few of my books for sale. This week I'm off to give a talk in Sutton Coalfield on Wednesday and I am planning to start on a peice for Quilt 2008 during the rest of the week - I have some idea of what I want to do, but I need to play with some designs first. Today I e-mailed an article to a Danish patchwork magazine, who wanted me to write about making a needle case like the one in the middle of this picture, with the two diamonds on the front. With all the fabrics in this picture I have used heat in some way, either by using a soldering iron or a heat gun. I usually stitch lots of layers together and then burn. 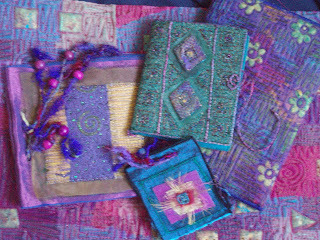 [These fabric books also appear in my book Glitzy Quilts.] - I'm not a very good saleswoman, but I am trying! I'm hoping to experiment with some painting this week, I was inspired by an article in Cloth, Paper, Scissors by Kelly Rae Roberts - look at her website - kellyraeroberts.com - she's a very good figurative artist, I'm not, but I like the way she does her backgrounds. I'm also stitching a quilt I made about 10 years ago which I never finished - but enjoying the challenge. It's nothing like my present work and it won't be seen until the Festival of Quilts.